In limited, if you're still around when you can cast this card, your opponents will not be for long. This is an utterly brutal card. Save a Dogged Hunter with Instill Energy, it will end most limited games (what limited format possibly has Dogged Hunter AND Instill Energy AND Crush of Wurms). I think too many people are concentrating on this card's type 2 ability, which is limited. In a now much slower Extended environment (well, slower in November), people will be able to cast this card on turn 4 or 5 with little problem thanks to Elves and Cradles. Mono-green got a huge boost here with the Wurms, so don't overlook it. just because of its nutty card advantage. Way too costly for Constructed. A 3.5 (4 if it cost a bit less) in Limited, a 1.5 in Constructed. 1) The game is already over. 2) They've stripped it from your hand. 4) They've got control (either through Ensnaring Bridge or having a Wrath in hand). 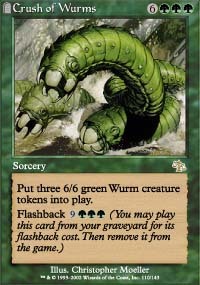 In limited, however, the 6 Wurms you will get will come up eventually. And they will cause serious problems with your opponent's math. a silly amount of mana, even if you only want to cast it once. In constructed play, Crush is the icing on the cake for a mono-Green deck. limited, where mana is more plentiful and creature advantage is paramount. Werebears and a Krosan Restorer. Otherwise it's just too damn hard to cast!